Welcome to Day 3 of the Cozy at Christmas Holiday Tour 2017. 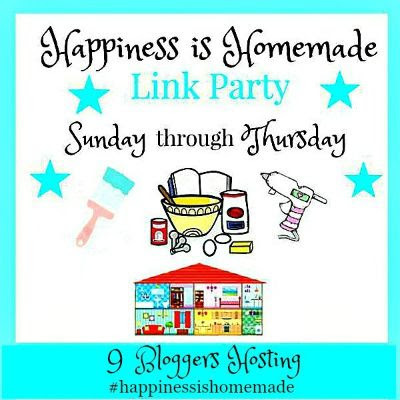 Thanks to Katie at Let’s Add Sprinkles for hosting. I am so honored to be included this year! Once you’ve finished here, I hope that you’ll take a few more minutes and visit the rest of my friends on the tour! Decorating for Christmas in the kitchen is always one of my favorite things to do. 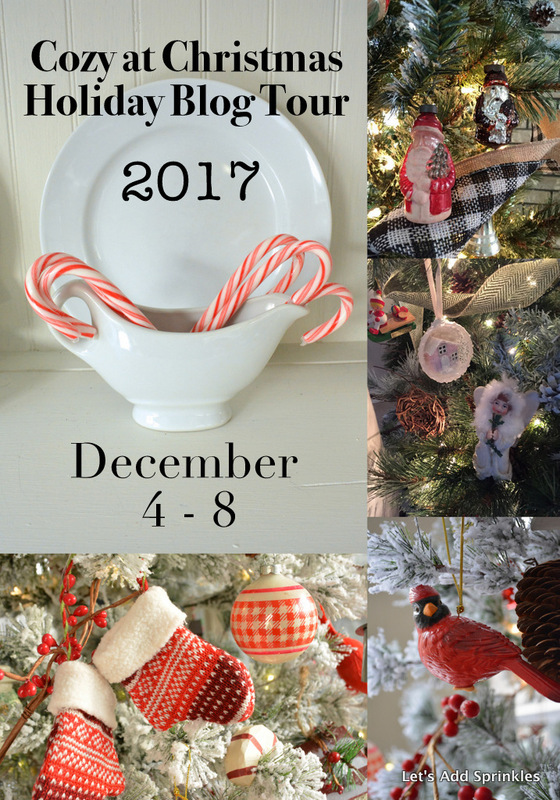 It’s where my family and I spend a lot of time, so what better place to have a little decorating fun? In my family, it doesn’t matter whether we are eating, cooking or just hanging out, we always have fun! This years table is a mix of traditional items and a little bit of whimsy. For the past few years I’ve really been loving plaid. 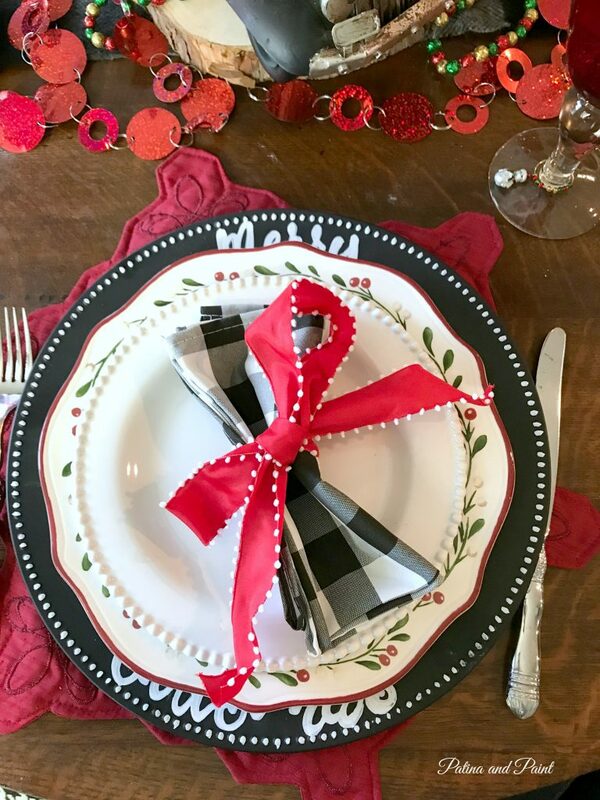 My table has a gray and black plaid scarf for a runner, along with black and white buffalo plaid napkins. 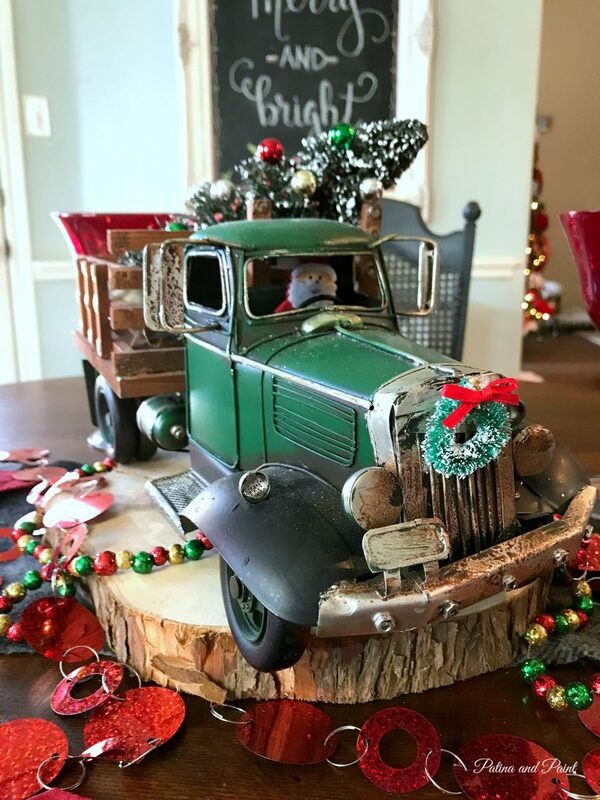 What better centerpiece than Santa delivering Christmas trees in his vintage truck? 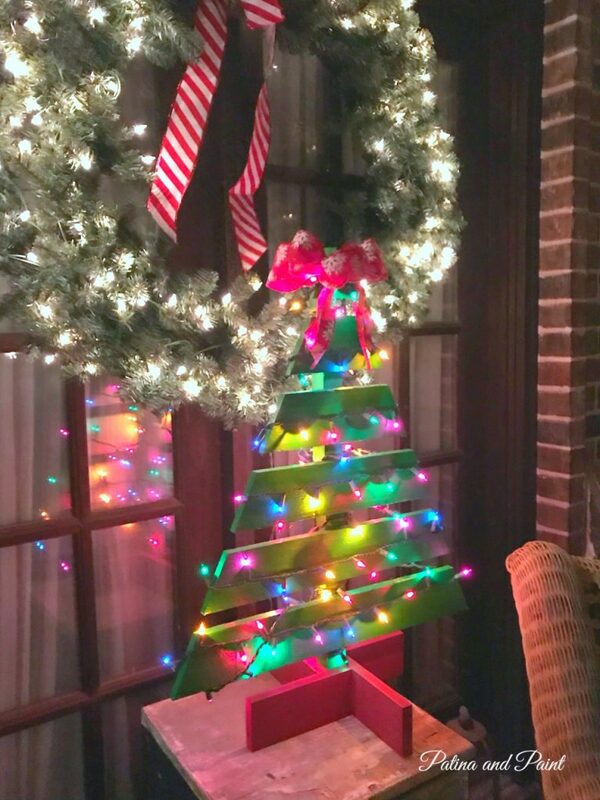 We cut down a tree here at the Castle earlier this year, so I had The Hubs cut a few slices of wood from the tree to use in my Christmas decor. 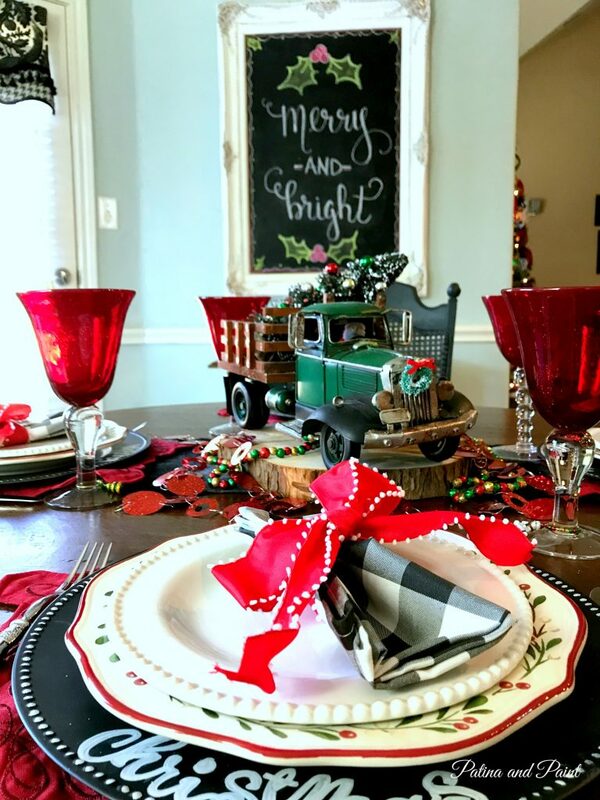 Traditional red snowflake placemats, followed by black chalkboard Merry Christmas chargers are a great base for my holly Christmas dishes. The hutch gets a few decorations too! 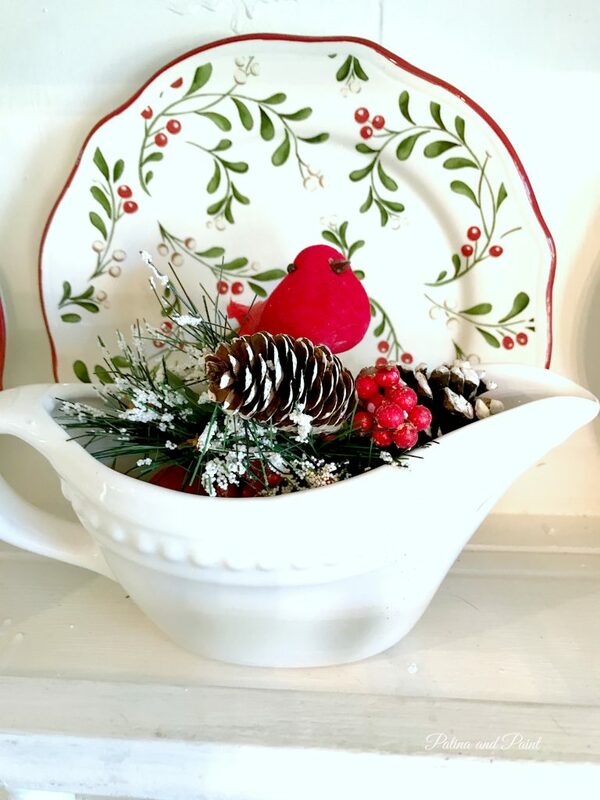 I add my Holly dishes to my year round white ones. The dishes are not only functional, but they are too pretty to be put away in the cabinets! A few evergreen sprigs, berries and pine cones added here and there give it a festive feel. Naughty or nice? That pretty much sums up my family for sure! I keep the decorations in the rest of the kitchen to a minimum. It is a working kitchen after all! 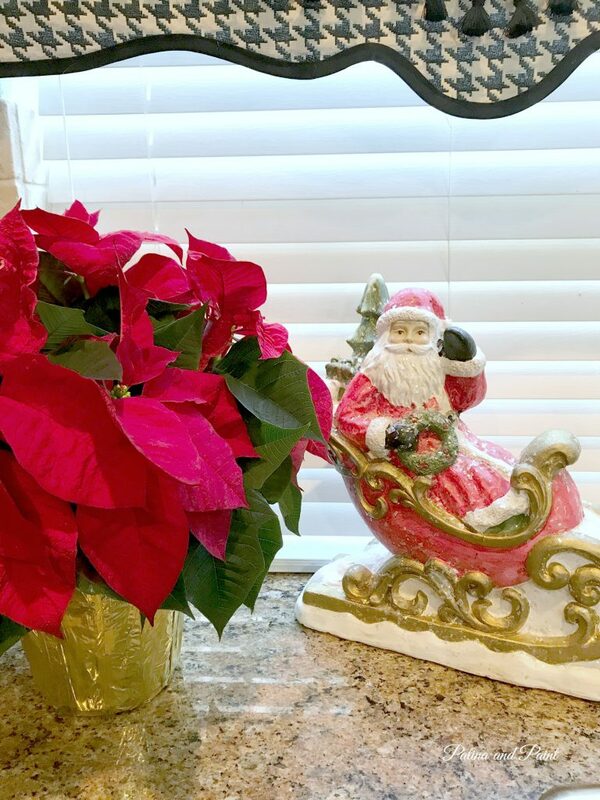 Above the sink is the perfect place for some poinsettias and Santa to hang out. We don’t have an elf on the shelf here at the castle, but we do have a few elves that like to hang out! I guess they are just like everyone else, they just want to be in the kitchen where all the fun, food and love is happening! You know you don’t want to miss this! This is delightful. I love the elves on the jars. Too stinking cute. Did you make the chargers? They are precious. Thanks for being a stop on our tour. I love your kitchen! Thank you Katie! Yes, I did make the chargers. 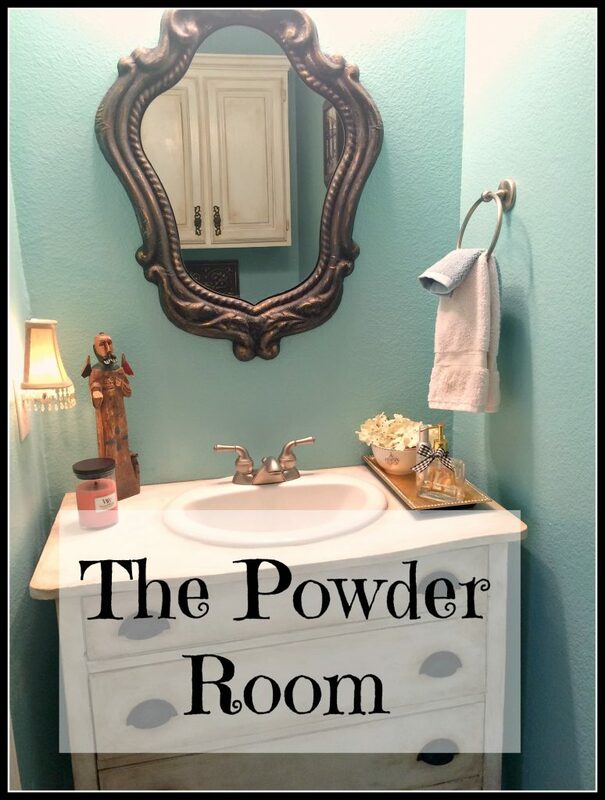 Chalk paint spray paint and a paint pen! Thanks so much for including me in the tour. I’ve had so much fun. Tammy I love your hutch and those Christmas plate chargers are perfect! Did you buy them or make them? So cute! Loved your snowy glass jars too. Great inspiration, great tour! Thank you Cindy! I did make the chargers. 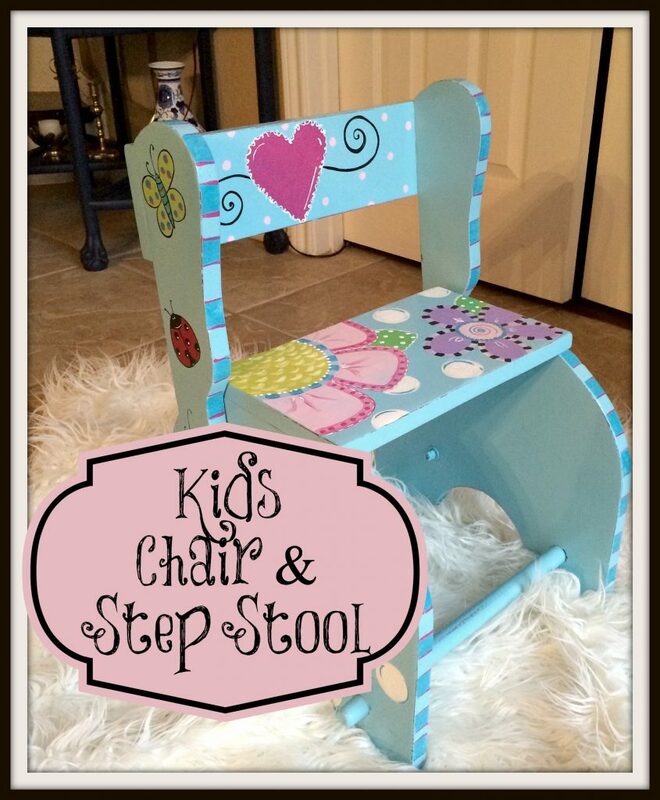 Spray chalk paint and a paint pen! I am in love with your kitchen Christmas decor. That chalkboard is so adorable! I also love the chalkboard chargers! Everything looks perfect. Have a wonderful Christmas! Thank you Heather. Merry Christmas! 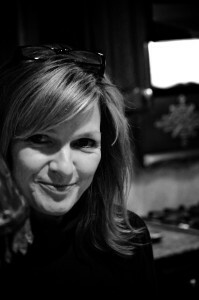 Tammy- I love your home and I especially love the touches of black. What a great idea for a runner! My day in the tour is tomorrow. 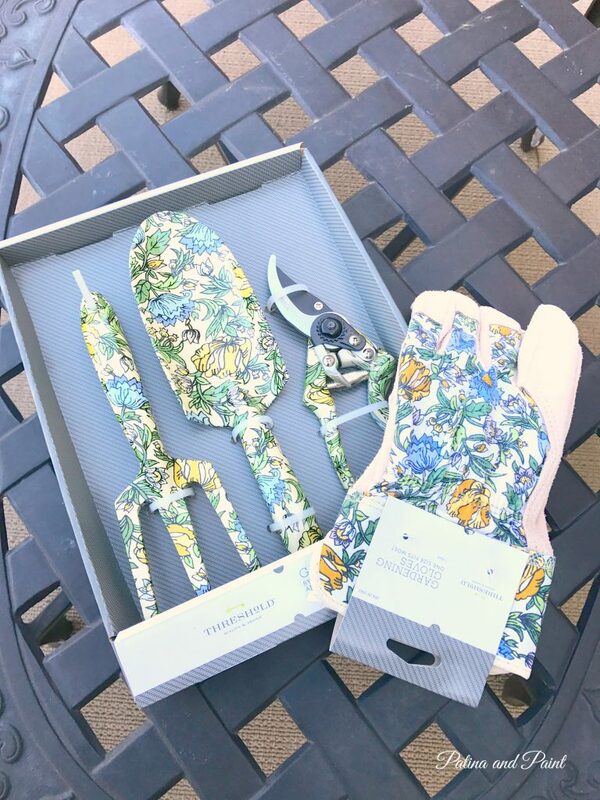 Tammy, your kitchen looks so fun and definitely cozy! I love your table settings from the black chargers to the pretty holly plates. 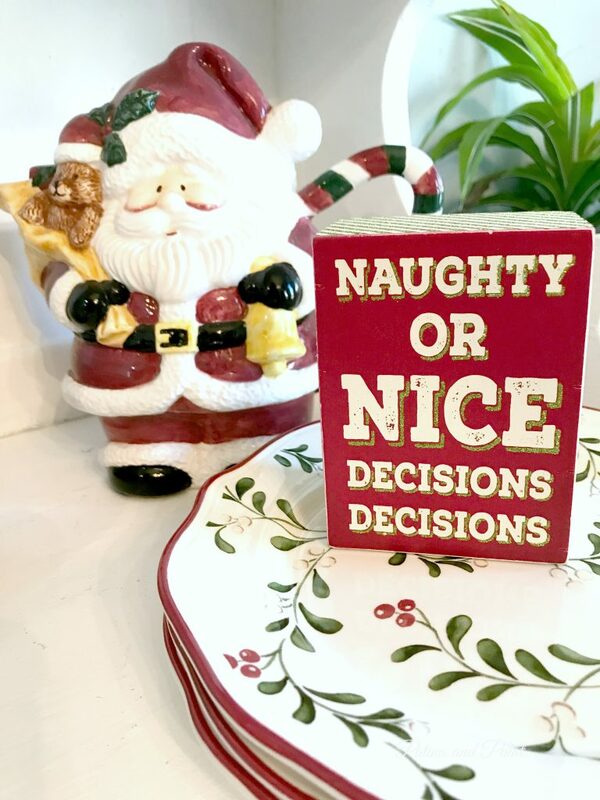 And your Naughty or Nice sign brought a laugh. So cute! Great kitchen decor for Christmas, Tammy. Love the fact that you saved some wood chargers for your decor. You’ll get tons of mileage out of those. 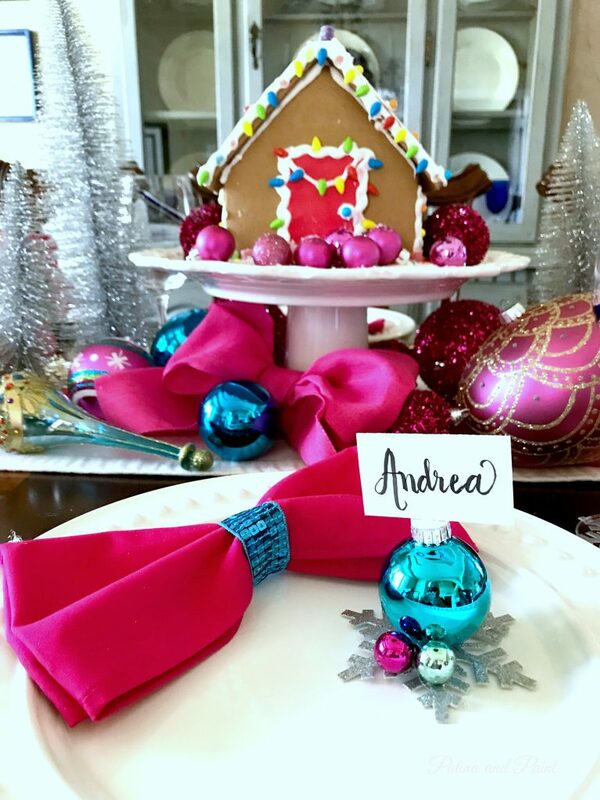 The tablescape is really cute. Tammy, your kitchen is wonderful! I love the colorful whimsy you’ve included. 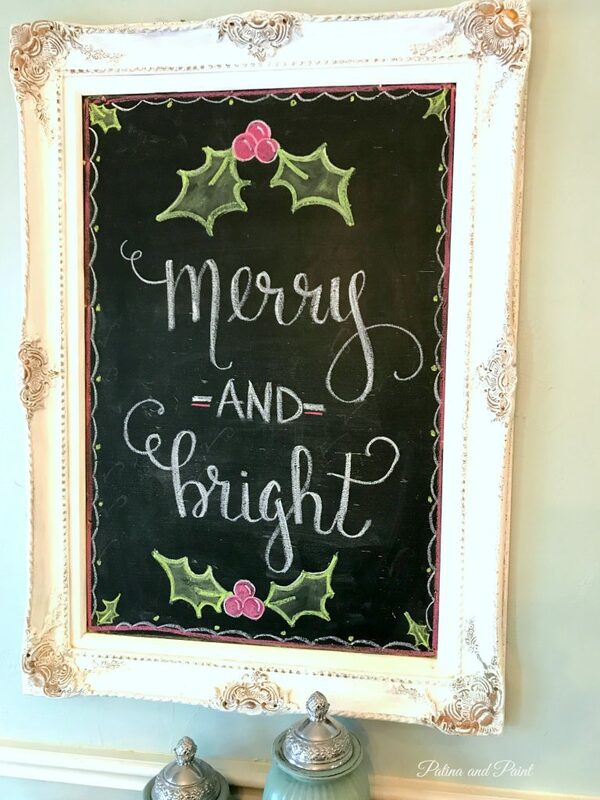 Your chalkboard is a work of art! 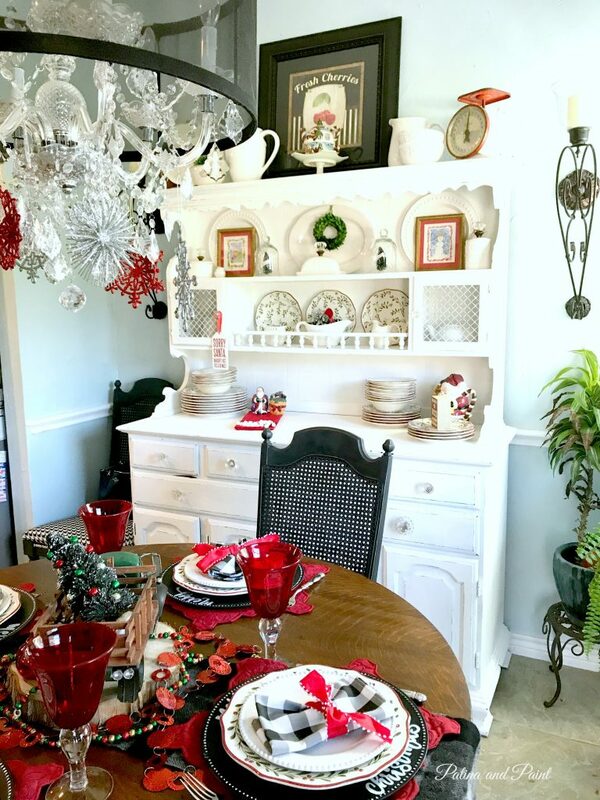 Tammy, I love your Christmas kitchen! I have had a love for plaid for many years. Your table is just delightful! 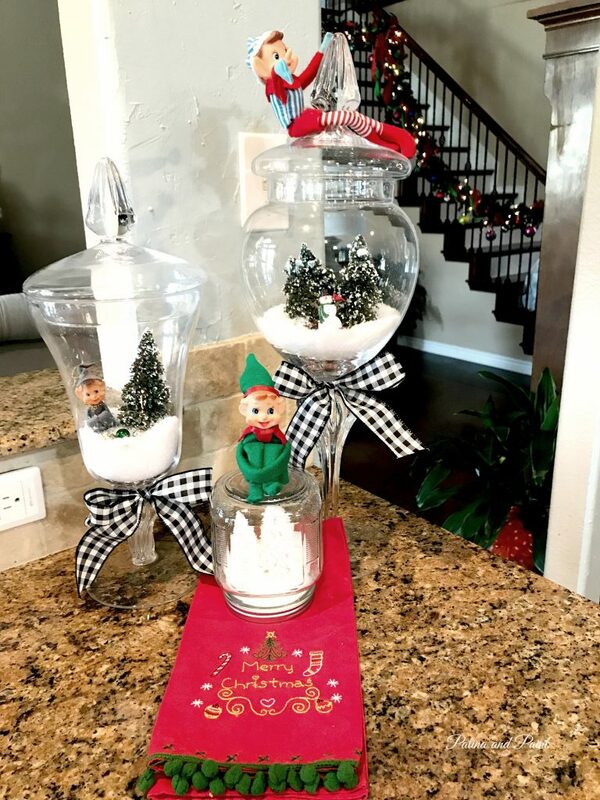 Love your cute elves in the jars. Good way to keep them from causing to much havoc around the house. 🙂 The kitchen is the heart of the home and one of my favorite places to decorate as well. Everything thing looks so fun and festive. You have such an eye for details.